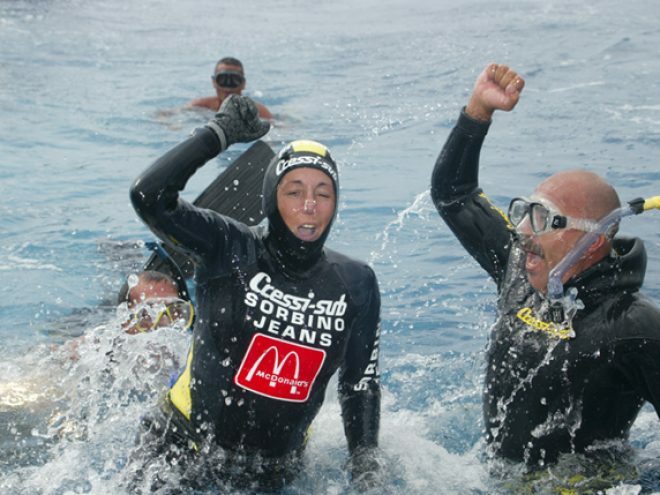 When the exceptional Cuban apnea diver Déborah Andollo would throw seven coins into the sea before diving into its waters, perhaps people wondered if it was a publicity stunt or an eccentricity of the star. However, hundreds of thousands of her fellow countrymen and countrywomen, practitioners of the religion known as ‘regla de ocha’ or ‘santería’, would nod with respect and in complicity because they knew what it was all about: Déborah was asking the Mother of the Seas, Yemayá—syncretized as the Virgin of Regla, patron and protector of seamen—for permission to enter her kingdom because it is said that her anger is implacable and her punishments, horrific. And Yemayá not only allowed this young woman to penetrate her realm, she let her share her reign of the sea and bound her forever to her blue and silent world. Ever since I was a child, I felt attracted by the sea. I wasn’t scared by it and I felt so assured that when I was only three years old I almost drowned, so later on my parents decided that I should enroll in a swimming academy. As a teenager, I would go to the Playita de 16 in Miramar and compete with the boys to see who could go farther… or deeper. I practiced synchronized swimming and was the captain of the Cuban national team for twelve years. After a short time as a model for underwater photography—which served to shake off my aqualung and prove to myself that I could go down 38 meters—early in 1997, I began practicing apnea, the voluntary interruption of respiration which, for us, goes hand in hand with the search for depth, until I retired in 2002. In her cozy home of El Mégano—one of a string of beaches to the east of Havana—Déborah Andollo welcomes us warmly and in an unassuming manner, surprising in someone who with her approx 6-litre pulmonary capacity has set sixteen world records in the four apnea diving categories; has been included among the top 100 Cuban athletes of the 20th century; was awarded the Marine Oscar in 1996 and selected Best Diver in the World in 1997; is the undisputed star of a sport which is so competitive that, in her own words, ‘either your a champion or your nothing’; is Vice-President of the Ibero-American Underwater Activities Federation and President of its Scientific Committee; and has been given beautiful appellations, her favorite being ‘Neptune’s Sweetheart’. Born on May 9, 1967, of average height (1.63 m), seemingly fragile yet bursting with energy, naturally elegant and distinguished, her enjoyable conversation easily flows into the topics she is most passionate about: her sport—the first records go back to 1950 when Italian diver Raimondo Bucher went down 22 meters and scarcely ten years later, in 1960, French diver Jacques Mayol went down 100 meters—and the challenges she faces as president of the Cuban Underwater Activities Federation. Apnea is an ancient practice: the earliest references go back to c. 4,500 bc when Japanese women divers—called amas—were forced to search for pearls on the seafloor; in Ancient Greece, apnea was used in wars,; and in America, in pre-Columbian Peru, to search for food, as very probably our own aborigines did too. For me it is something spiritual, which not only demands, as any other sport, the willpower to give up many pleasures, the resolve to train and study, but also an enormous control of the mind, a great capacity for introspection, a profound knowledge of oneself, of one’s ability, or no, to surpass certain limits, and an essential disposition to feel in harmony with Nature. In Cuba, the practice of deep apnea has two high points, first in the 1980s with diver Pipín Ferreira and in the 90s with myself, but this is a very expensive sport that requires support teams with divers, doctors, boats, hyperbaric chambers, facilities… it still hasn’t been recognized by the Cuban Olympic Committee, therefore, one of the Federation’s task is to combine wills and solidarities so that the human potential that we have, especially among underwater fishermen, is not lost. We are also interested in developing specialties such as dynamic apnea, which consists in reaching the greatest distance possible, and static apnea where the athlete, floating on his stomach, tries to retain his breath as much as he can. These are more accessible, less expensive styles, although it does not imply giving up the constant ballast, because this would mean giving up the very essence of apnea. Another topic which the Cuban champion has a passionate interest in is environmental education and she is actively involved in a great number of projects and programs aimed at the protection of the environment. The human race doesn’t seem to realize that the survival of man as a species depends on the preservation of the environment. Nature is being increasingly assaulted, the environment deteriorates and I believe that legal regulations should go in close association with an awareness for Nature since early age when it is easier to feel that you are part of Nature and you learn to love and take care of it. Explaining to children how long it takes a can to decompose in the sea, speaking to them about how many turtles are asphyxiated when trying to swallow a plastic bag that they took for a jellyfish, or going with them to pick up trash that has been thrown along the coast and beaches may be more effective than fining an adult who has unconsciously already become a predator. Considering her many interests and the passion she puts into everything she does, we wanted to know how Deborah Andollo spends her time. I am, luckily, a very busy woman. I enjoy looking after my son Ernestico, whom so many times I had to leave behind during training or competitions. I study and organize the courses I teach. I attend meetings at the INDER (National Institute of Sports, Physical Education and Recreation), and try to find collaborations for the Federation. I may also carry out other activities, such as the organization of the First National Festival of Underwater Photography, which was held from 5-6 May, 2007 in Havana, or the organization of competitions as part of the training of our young athletes. I do housework, swim, jog with my husband, practice gymnastics. I attend yoga classes three times a week. I read many magazines about scuba diving, apnea, underwater fishing, as well as books on psychology, yoga and meditation. I give lectures on the protection of the environment and take part in films or other audiovisual media associated with the environment. And I still take time out for gardening, listening to music, reading—mainly novels and testimonies—and dancing, especially Cuban music. Someday, I don’t know when, I’ll take up handicraft, which I love. Can it be that Yemayá—grateful to whom zealously watches over her realm, whom she prefers to see with the eyes of the soul, blessing her triumphs and protecting her while she placidly swims grabbing hold of a shark’s fin—has bestowed on this favorite daughter the gift to multiply time?